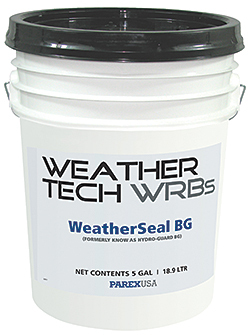 WeatherTech WeatherSeal BG is for use on below-grade horizontal and vertical surfaces. It is a single-component, non-fibrated, asphalt-modified, neoprene membrane that can be either troweled, rolled, brushed, or spray applied. Allows low levels of moisture vapor to escape to prevent blistering and delamination of the applied membrane while prohibiting moisture infiltration.